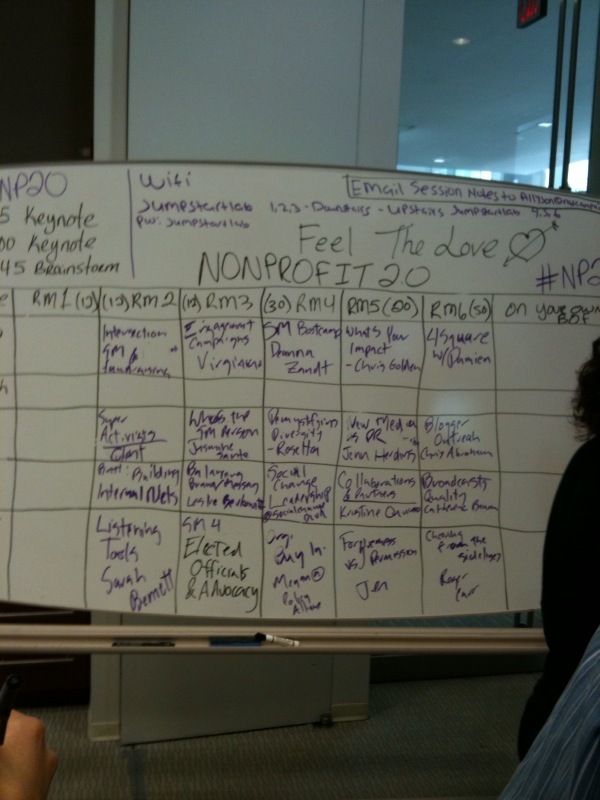 Last week I attended NonProfit 2.0, an unconference dedicated to the social cause space. It was a most productive day. What is an unconference? It’s a group of people who come together to learn in a common field — in this case, social media media and its value in the nonprofit world. The organizers were Alysson Kapin, Geoff Livingston and ShireenMitchell. The people who show up make the session, they told the audience. We heard from two keynote speakers first thing and then as participants, we tossed out topics we wanted to learn more about. Some had been suggested via email in advance. And just because you suggested the topic didn’t mean you had to lead it, although that did happen. Before I knew it, it was almost 5 p.m. on a Friday afternoon. How could the unconference be over? It was an unconvential and productive way to spend a Friday afternoon. I have dozens of ideas for my blog (I’ll be sharing with you throughout the coming weeks) and for work. I also had lots of business cards and 12 pages of notes on my Netbook. Now I simply need to find some unfilled time to make it all happen. Geoff Livingston, a professional communicator, author and co-founder of Zoetica, is taking citizen journalism to the Gulf today. 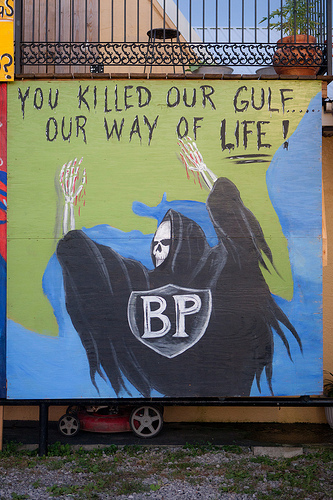 He and others want to find ways to help the fishermen impacted by the BP oil spill. Working with Citizen Effect, a nonprofit in Washington, D.C., Geoff and others will be in the Gulf this week to talk with those impacted and with those who are able to affect change. In addition to the social media platforms, Geoff says, he already has several commitments for wider distribution. “We anticipate it being reported a little bit,” he says. One way to do that is to tell their personal stories. When you finish a project do you celebrate? Maybe you simply check it off your long list and move on to the next project. The next time you feel inclined to do that, pause for a minute and reflect on how the project or event was a success. Then think about areas where you might improve, ratcheting up your plan. I just finished a big event and I’m already working on three other projects that didn’t get as much attention as they should have while I was completing the final items for the event. It would be easy to simply put a checkmark beside the event and move on to the next three projects. Instead, I’ve scheduled a debrief sessions with all who were involved with it, no matter how small the role played. We’ll review our project plan and consider key areas. Were our goals met? Did it address our strategic needs? One thing there won’t be is finger pointing. This isn’t about saying who did or did not do a good job. This is about improving for the next time. The extra hour it will take to debrief and create what I call an After-Action Report means that the next event will be even better. What do you think? Is it worth to take the extra time to review? Despite playing Sudoku, reading and engaging in other mental activities, I’ve found myself forgetting names and other important information, if only for a moment. I’m really not that old but it was definitely beginning to bother me. I spent a week consciously paying attention to whether I multitask. It was worse than I realized. For example, one evening while watching TV (I at least stayed on one channel), I also caught up on Facebook, answered emails and viewed one YouTube video. On one set of commercials I hopped up to wash dishes. On another set, I watered plants. That is only one of many examples. So I’ve made a conscious decision to multitask less. I’m not going to eliminate multitasking, but I can definitely reduce it. I put my cell phone in my purse in the trunk so I can’t access it while driving. Now I’m focused on the road. If I watch a movie, I turn off the lights and put the laptop away. The only thing I’m doing is watching the movie. It’s an adjustment, but, you know, I am more relaxed and my concentration seems to be improving. Either that or the Sudoku is finally paying off. I’m a “just the facts” kind of girl. As a newspaper reporter, I cut my teeth on the police beat. I covered city and town government. I covered higher education. Eventually I moved into feature writing, but I struggled to paint a picture for my readers and create a connection. Now I have a new way of looking at my writing. I focus on “romancing the writing.” It’s a phrase I heard during a recent meeting. We were talking about messaging in the context of donors and how we could connect in a more meaningful way with them. But the “romancing the writing” phrase is applicable on so many levels. Writing this blog is one way that I think I am “romancing the writing” and that’s because I have a clear picture of you the readers of this blog. I can imagine you asking me specific questions and so as I write, I weave in the answers. I think about what might be relevant or of interest to you. It applies when I write my column for NFPW’s monthly e-letter. It applies when I’m writing a speech or a magazine article. Only now instead of simply painting the story, I try to introduce some romance into the writing so that the reader or listener will be intrigued by my flirtation with them and will want to read further or listen longer. I attempt to punctuate my writing with gems and other small gifts. When the reader finishes the article or the listener has heard the final words of the speech, I hope they will have enjoyed the date and will want to make a commitment to meet again. Romance – on any level – requires work, and never more so than in writing. We’re snacking on content all day as a result of social media, says Steve Rubel, senior vice president and director of insights for Edelman Digital. He made his comments as part of the recent online Social Media Summit. Did you know that Americans visit on average 111 domains each month? Or that we view 2,500 Web pages each month? So what does the future hold? He says that we will have digital embassies and that we must equip employees to become ambassadors. It’s critical that each of us embraces multiplicity and diversity. And, simply, use the force, don’t fight it. Being digitally visible will include paid search, owned search SEO, earned search and social search. YouTube is the #2 searched site behind Google. The trends aren’t that different from traditional communications. We all had to adapt to electronic communications. We have to ensure that our company or product is visible in a 24/7 environment. And we have to monitor, measure and analyze our efforts.